A special exhibition marking the 25th anniversary of the Missing People charity will be on display in Shoreditch next month. Unmissable, which features portraits of missing people created by new and established artists, will form part of the Other Art Fair, which offers emerging artists the chance to sell directly to buyers. It takes place from 14-17 March inside the Old Truman Brewery on Brick Lane. Unmissable is curated by Ben Moore, whose brother Tom has been missing since 2003, and all proceeds from its sales will go to Missing People. One portrait that audiences may recognise is that of Richard Edwards, the Manic Street Preachers’ guitarist, who was last seen on 31 January 1995 checking out of the Embassy Hotel in Bayswater. Just over two weeks later, Edwards’ car was discovered near the Old Severn Bridge – the last known fact surrounding his disappearance. His sister Rachel Edwards said: “For the last 24 years I have lived in hope of solving the mystery of what happened to Richard. “I am desperate for news as to his fate and am appealing to the public to help me. “I hope the exhibition will be a poignant and effective way of raising awareness for Missing People, a charity that has and continues to support my family and I for almost 25 years. “I’m so pleased that the money raised will go towards helping them to continue to be there for others like me and will shine a light on all missing people, and their families, and hopefully bring us some answers. Artist Will Teather said painting Edwards had led him to reflect on the loss of his talent, but also “how hard it must be for any family to never know the fate of their siblings”. He added: “I’ve known and liked Ben Moore, the curator of this exhibition, for several years and agreed to be part of this show, knowing how hard it must have been for him to lose his brother. The portrait of Edwards will be one of a number exhibited for the first time at the Other Art Fair. Eleven artists are taking part, including Hackney-based Charming Baker and Samira Addo, who won 2018’s Portrait Artist of the Year competition on Sky Arts. The portraits will soon be available to bid for on art auction site Paddle8, with all proceeds going to the Missing People charity, which provides 24-hour support to the families of the 180,000 children and adults who go missing every year. Curator Ben Moore said: “Will Teather’s portrait of Richard Edwards reminds me of the [Doc Martens] boot-wearing, gothic culture back then in the mid-nineties that I myself subscribed to as a teenager growing up in London. 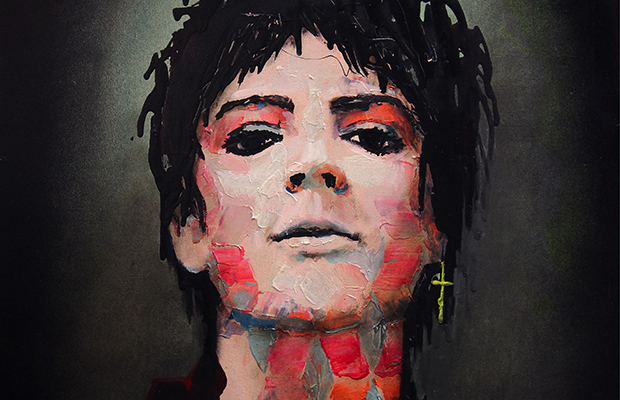 “I think it’s really poignant that the artist was such a fan of the Manics. “Also important to note that Richard Edwards has been missing nearly as long as the charity has existed. Other Art Fair’s UK manager Jessica Chow said: “We’re proud to support Missing People as our charity partner. Unmissable will be on display as part of the Other Art Fair from 14-17 March at the Old Truman Brewery, 91 Brick Lane, E1 6QR.